Gregory John Norman AO (born 10 February 1955) is an Australian professional golfer and entrepreneur who spent 331 weeks as the world's Number 1 Official World Golf Rankings ranked golfer in the 1980s and 1990s. He has won 91 international tournaments, including 20 PGA Tour tournaments and two majors: The Open Championships in 1986 and 1993. Norman also earned thirty top-10 finishes and was the runner-up 8 times in majors throughout his career. He was inducted into the World Golf Hall of Fame in 2001 with the highest percentage of votes (80%) of any golfer to date. In a reference to his blond hair, size, aggressive golf style and his birthplace's native coastal animal, Norman's nickname is "The Great White Shark" (often shortened to just "The Shark"), which he earned after his play at the 1981 Masters. After (and during) his playing career, Norman engaged in numerous entrepreneurial and philanthropic endeavors. He currently serves as the Chairman and CEO of Great White Shark Enterprises, a global corporation with a portfolio of companies in fields like apparel, interior design, real estate, private equity, golf course design, and more. Norman has also donated to and established numerous charities and charity events like the Franklin Templeton Shootout which benefits the CureSearch for Children's Cancer fund. He became a Trustee of the Environmental Institute for Golf in 2004 and received the Golf Writers Association of America's Bartlett Award in 2008 for his philanthropic endeavors. Norman was born in Mount Isa, Queensland, Australia to Merv and Toini Norman. His mother was the daughter of a Finnish carpenter, and his father an electrical engineer. As a youth, he played rugby and cricket and aspired to be a professional surfer. His mother, who had a single-figure handicap, taught the 15 year-old Norman how to golf and allowed him to caddy for her at the Virginia Golf Club in Brisbane. Within about eighteen months, Norman went from a 27 handicap to a scratch handicap. Norman attended Townsville Grammar School in Townsville, Queensland (enrolled 1964) then moved on to Aspley State High School on the north side of Brisbane. In 1975, at the age of 20, Norman served as assistant professional under Billy McWilliam OAM at Beverley Park Golf Club in Sydney, New South Wales. Shortly thereafter, in the same year, Norman started work as Charlie Earp's trainee in the Royal Queensland Golf Club pro shop, earning A$38 a week. In 1976, six years after he first began to golf, Norman turned professional as a tournament player. That year he earned his first victory at the West Lakes Classic at The Grange Golf Club in Adelaide, South Australia. He joined the European Tour in 1977, and had his first victory in a European event that same season, the Martini International, at the Blairgowrie Club in Scotland. In 1980, Norman earned a sizable victory in the French Open, winning the tournament by ten shots. He won the Scandinavian Enterprise Open in Sweden with a course record of 64 in the final round. Later in 1980, Norman won the Suntory World Match Play Championship. Norman also won his first Australian Open that year, his first of five wins in that event. In 1981, Norman finished in 4th place on his debut at the Masters in Augusta, finishing just three strokes behind the winner Tom Watson. Norman had a victory in the 1981 British Masters and he won his third Martini International tournament that year as well. In 1982, Norman was the leading money winner on the European Tour. He won three European events that year, including successfully defending his British Masters title. The following year, Norman joined the U.S. PGA Tour. 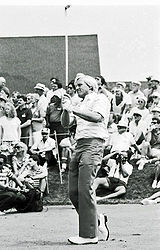 In June 1984, Norman won his maiden PGA Tour victory at the Kemper Open, winning by five strokes. He gained worldwide prominence a week later at the 1984 U.S. Open. Norman holed a dramatic 45-foot putt on the 72nd hole to force a playoff with former Masters champion Fuzzy Zoeller. At the next day's 18-hole playoff, Zoeller would earn a 67-75 victory over Norman. He was able to put the defeat behind him with a victory at Canadian Open the next month in July for his second win of the year. In 1985, Norman won the Toshiba Australian PGA Championship and the National Panasonic Australian Open. He had two runner-up finishes in the U.S. PGA Tour that year, finishing tied for second place at the Canadian Open and at the Bank of Boston Classic. In 1986, Norman's 11 worldwide victories that year included four wins in Australia and two regular PGA Tour events; the Panasonic Las Vegas Invitational and the Kemper Open (for the second time) but 1986 is remembered for the Norman Slam or the Saturday Slam. Norman held the lead for all four majors through 54 holes. This meant he played in the final group for every major and had perhaps the best chance in history of winning the single season Grand Slam. 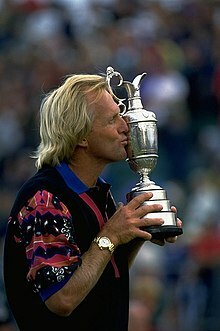 However, the only major victory Norman earned that year was in the 1986 Open Championship at Turnberry. At the 1986 Masters, Norman started with the lead until he double-bogeyed the 10th hole. After making four consecutive birdies on holes 14 to 17, Norman was tied with Jack Nicklaus going to the 18th. Norman missed a par putt on the 18th that would have sent the two into a sudden death playoff. At the 1986 U.S. Open at Shinnecock Hills, Norman again led after 54 holes. However, Norman faltered on the final day, finishing with a final round 75 placing him six strokes behind the winner, Raymond Floyd. 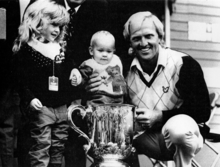 Norman's 1986 World Match Play victory with children Morgan Leigh and Gregory. Norman finally broke through at the 1986 Open Championship for his first major title. Norman shot an efficient second round of 63 on Friday at Turnberry. Only 15 players broke par in the second round. Tom Watson described Norman's feat as "the greatest round ever played in a tournament in which I was a competitor." Norman survived the weekend's brutal conditions at Turnberry, with a final round of 69 to win The Open by five shots. After being presented with the Claret Jug trophy, Norman said: "Outside of Australia, Britain was the first place that accepted me as a professional golfer. To win my first Open in front of the British public is the greatest feeling ever." Norman was again in contention at the 1986 PGA Championship. He was in the lead on the final day, but shot a final round 76 to finish 2 strokes behind the eventual winner, Bob Tway. Norman's four wins in Australia in 1986 helped him to finish top of the Australian Order of Merit for the fifth time. He also topped the U.S. PGA Tour money list for the first time that year. In September 1986, Norman won the Panasonic European Open at Sunningdale Golf Club and the following month he had another victory in England, winning his third World Match Play Championship at Wentworth. Norman ended 1986 with eleven worldwide victories and was officially ranked number 1 in the brand new Official World Golf Rankings. Norman endured another setback at the 1987 Masters, narrowly missing a birdie putt on the 72nd hole that would have won him the tournament. Instead, Norman went into a sudden-death playoff with Larry Mize and Seve Ballesteros. Mize would win the tournament by holing a 47-yard chip shot. Norman did, however, win the Australian Masters in February 1987 and the Australian Open later in the year by a record ten shots at Royal Melbourne Golf Club, beating the previous Australian Open record winning margin of eight strokes by Jack Nicklaus in 1971. Norman's 1987 victory at the Australian Open lifted him back above Seve Ballesteros to the top of the Official World Golf Ranking. Norman had another four wins in Australia in 1988. In the U.S., Norman won the MCI Heritage Golf Classic at Hilton Head Island, South Carolina in April 1988, inspired by a leukemia-stricken teenager who got his wish to meet Norman and watch him play. The teenager was only supposed to watch the golfer for two rounds, but Norman arranged for him to stay until the tournament's completion. After the tournament, Norman awarded the teen with the trophy. He was inducted into the Sport Australia Hall of Fame in that year. At the 1989 Masters, Norman missed a 12-foot par putt on the 72nd hole which would have put him into a playoff with Nick Faldo and Scott Hoch. Norman had another chance at a major in 1989, this time at the Open Championship at Royal Troon. He played a final-round of 64, starting his round with six straight birdies, to force his way into a playoff with Mark Calcavecchia and Wayne Grady. Going into the final playoff hole, Norman and Calcavecchia were tied, but two successive bunker shots by Norman gave Calcavecchia the victory. Norman won the Doral-Ryder Open and Memorial Tournament in March 1990 after having missed the cut for the first time at the 1990 Masters. Although 1990 was not Norman's strongest majors year, he finished at the top of the PGA Tour money list for the second time in his career and won the Vardon Trophy and Byron Nelson Award. Later that year, he won the Australian Masters in his home country for a final and record sixth time. Norman's second Major championship, 1993 Open at Royal St George's. After a career slump in the early 1990s, Norman turned to renowned coach Butch Harmon for help. Together, the two rebuilt Norman's game by solving mechanical problems that had crept into his swing. As a result of this training, Norman earned his second major at Royal St George's in the 1993 Open Championship. There, in ideal conditions, Norman defeated a leaderboard consisting of Nick Faldo, Bernhard Langer and Corey Pavin. Norman's final round 64 was the lowest score by a winner in Open history until Henrik Stenson's 63 at the 2016 Open Championship. During the following year, 1994, Norman easily beat records for the lowest 18-, 54-, and 72-hole scores at The Players Championship. After opening with a course record-tying 63, he followed with three 67s to give him a final total of 264 strokes, or 24 under par – six strokes better than any previous winner. Norman finished third at the 1995 Masters and was the runner-up at the 1995 U.S. Open. In June, Norman won his second Memorial Tournament, a victory that marked the beginning of one of his best years on the PGA Tour. After his win at the Canon Greater Hartford Open, aided by a chip-in in for eagle on No. 14 in the final round, Norman overtook Nick Price as the number one golfer in the world. Later, he won the NEC World Series of Golf, holing a 70-foot birdie chip shot to defeat Billy Mayfair and Nick Price in a playoff on the first hole. He ultimately held the No. 1 ranking for 331 weeks in his career. He also topped the money list for the third time and was named PGA Player of the Year. 1995 is arguable Norman's greatest year even without winning a major title. Norman tees off in windy conditions at the 2008 Open Championship at Royal Birkdale. The following year, Norman opened the 1996 Masters Tournament with a course record-tying 63 which put him at the top of the leaderboard. He held the lead through three days of play. Norman took a six-stroke lead into the final round and lost the tournament to Nick Faldo by five strokes, shooting a Sunday 78 to Faldo's 67. In January 1997, Norman won his largest winner's check to date, one million dollars, when he won the Andersen Consulting World Championship of Golf. Norman then won two tournaments in 1997, but they were his final victories on the PGA Tour. In 1998, Norman missed part of the season after suffering hip and shoulder injuries. In July 2008, despite not playing in a major for three years, Norman finished nine over par in a tie for third at The Open Championship after being the 54-hole leader by two strokes. At 53, he set the record in becoming the oldest 54-hole leader in a major championship; a record that would last for just one year, until 59-year-old Tom Watson led the 2009 Open Championship after three rounds. Norman turned 50 in February 2005, but has kept his distance from the senior golf circuit. This is due, in part, because of his focus on business, but also because of lingering hip and back issues. In 2003, Norman said: "Hitting about four million golf balls has created unfortunate wear and tear." He had knee surgery in October 2005 and February 2006. Norman believes his back injuries could have been averted had he been introduced to the concept of golf fitness early in his career. Norman has earned more than $1 million five times on the U.S. PGA Tour, including three Arnold Palmer Awards as the Tour's leading money winner in 1986, '89 and '95. He was also the first person in Tour history to surpass $10 million in career earnings. He has 30 top 10 finishes in Majors, or more than 38 percent of those he has entered. His 20 PGA Tour wins in the 1980s and 1990s ranks second only behind Tom Watson (21 total) during this span. He also has the lowest total four round score in the history of The Open Championship (267, in 1993), and The Players Championship (264, in 1994). Norman's dominance over his peers (despite his comparative lack of success in the majors) was probably best expressed in the Official World Golf Rankings: Norman finished the season on top of the ranking list on seven occasions, in 1986, 1987, 1989, 1990, 1995, 1996 and 1997, and was second at the end of 1988, 1993 and 1994. Norman won the PGA Tour of Australia's Order of Merit six times: 1978, 1980, 1983, 1984, 1986, and 1988. He won the European Tour's Order of Merit in 1982, and topped the PGA Tour's Money List in 1986, 1990, and 1995. He won the Vardon Trophy for lowest scoring average on the PGA Tour three times: 1989, 1990, and 1994; and was inducted into the World Golf Hall of Fame in 2001. In 1986, Norman was awarded the BBC Overseas Sports Personality of the Year Award, a feat he replicated in 1993 to join Muhammad Ali as a multiple winner of the award (now also joined by Roger Federer and Usain Bolt). In 2007, Norman was elevated to "Legend" status in the Sport Australia Hall of Fame.He received the 2008 Old Tom Morris Award from the Golf Course Superintendents Association of America, GCSAA's highest honour, at the 2008 Golf Industry Show in Orlando. Norman is a member of The Environmental Institute for Golf's board of trustees and also chairs The Institute's advisory council. He was also the recipient of the Golf Writers Association of America's 2008 Charlie Bartlett Award. In 2009 Norman was inducted into the Queensland Sport Hall of Fame. In 2015, the PGA of Australia established the Greg Norman Medal, which is awarded to the best Australian male or female golfer in a given year. He also received the Australian Global Icon Award and the National Golf Course Owner's Association Award of Merit both in 2015. Norman had a bold and aggressive style of play. He is widely regarded as one of the best drivers of the golf ball in his era, and perhaps the greatest in golf history. In the fourteen seasons between 1984 and 1997, Norman finished in the top 20 in total driving on the PGA Tour twelve times and in the top 6 nine times (including first in 1988, 1989, and 1993). When driving long and straight off the tee with a persimmon (wood) clubhead in his prime, Norman intimidated many of his fellow professionals. His high ball flight enabled him to carry the ball very long distances. In 2009, Nick Price said: "The best driver I ever saw was Greg Norman. N.P. . ca 2000. A.P.S. (autographed photo signed) Very nice clear signed and inscribed photograph of the Shark, Greg Norman. More about Photograph Signed.